MacElree Harvey, Ltd. is pleased to announce that Andrew R. Silverman, Esq. has been elected to the Board of the World Trade Center Delaware (WTC). For over 30 years, the WTC has been Delaware’s leading partner in international trade, working with local companies to research markets, develop leads, navigate currency exchanges and create global economy jobs throughout the state. The WTC works across many industries, especially with small, medium, and emerging businesses, in sectors as varied as agriculture, accounting, environmental remediation, IT, medical equipment manufacturing, biopharmaceutical research and development, and real estate development. 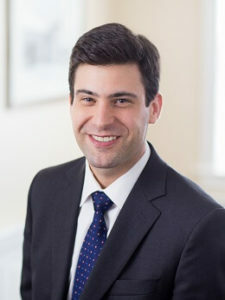 Mr. Silverman is a member of the Delaware and Pennsylvania Bars and is resident in both MacElree Harvey’s Centreville, Delaware and West Chester, Pennsylvania offices. Prior to joining MacElree Harvey, Mr. Silverman practiced law with a national commercial litigation and products liability firm where he acted as assistant national coordinating counsel for various Fortune 500 clients in defense of a variety of lawsuits. A graduate of the University of Pittsburgh (BA, 2007), he earned his law degree from Widener University School of Law (2010) in Wilmington, Delaware. Following law school, Mr. Silverman clerked for the Delaware Court of Common Pleas, where he assisted in the writing of judicial opinions. A member of the Chester County and Delaware State Bar Associations, he is also a member of the Main Line and Greater West Chester Chambers of Commerce. MacElree Harvey is a full-service law firm located in West Chester, Kennett Square, Doylestown, Bala Cynwyd, PA and Centreville, DE. Providing initiative in the practice of law for more than a century, MacElree Harvey serves clients in over twenty-five areas of law. To learn more about the firm, please visit www.macelree.com.